Thanks for your interest in the Hobee’s Story. We’re glad to have you with us as we continue to make history! Founder Paul Taber built the chain with a legendary attention to customer service. 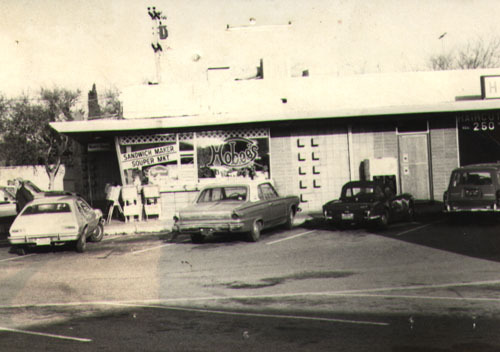 In 1974, the first Hobee’s Restaurant was founded by Paul Taber and his family in Mountain View, California. Located in a former Dairy Belle franchise, the first “Hobee’s Haven” initially served a variety of sandwiches and fast food-type items. Initially, there was no dining room and all the food was ordered and served out of two windows on the outside of the building (closed up, but still there today!). Soon after opening, the insurance office next door became available and the first expansion took place, resulting in a modest dining room with nine tables. Early on, Paul’s son, Peter, joined the team and brought with him an interest in vegetarian food and cooking. Along with Paul’s fervent commitment to great customer service and love for the bounty of California produce, they began to lay out the base for what would eventually become a Silicon Valley institution. The Tabers strived to create a community-minded family restaurant which featured freshly prepared food and outstanding customer service. Paul attached the made-up name “Hobee’s” to the restaurant because it evoked a fun, friendly image. Those first few years were challenging and humbling. The tiny Mountain View eatery consistently lost money, severely testing the Tabers’ resolve. At one critical juncture early on, the family van was sold in order to make payroll. As the healthy eating craze of the mid 1970’s took hold, however, Hobee’s name recognition began to steadily grow. Favorable word of mouth and several rave reviews in local papers prompted an increasing number of diners to sample Hobee’s exquisite breakfast and lunch menu, along with its wide array of healthy options. Buzz around town also centered on Paul’s “people first” philosophy of service; his genuine, caring attitude toward the customers was a refreshing change to those accustomed to the disinterested service offered by other coffee shops. Not surprisingly, Mountain View’s ascendance also corresponded with the introduction of the now-famous concoction craved by fans from around the globe: piping hot, streusel-topped, Hobee-made blueberry coffeecake. After a second expansion of Hobee’s Mountain View, the Tabers were emboldened to open a Sunnyvale location in 1976. That first Sunnyvale location was sacrificed by the Tabers when the opportunity to open Hobee’s Palo Alto – a superior location – arose. The family opened two more locations within the next decade: Stanford (1984) and San Jose (1986). By the mid 1980’s, Hobee’s had become enormously popular among Peninsula/South Bay diners. The four Taber-owned locations began to reap several important awards, including a slew of “Best Breakfast” citations from local newspapers. Booming business sparked the decision to franchise the Hobee’s concept. Franchising gave the Tabers the opportunity to work with others who shared the Hobee’s philosophy of caring and excellence. Among the locations opened during that era was the sole franchise to survive: Cupertino (1986). That site continues to thrive today. By 1990, Hobee’s had firmly established itself as one of the leading restaurant chains in California. Expansion, however, was slowed by a sluggish state economy. This respite from growth, however, provided a prime opportunity for Paul Taber’s son, Peter, to come into his own as the chain’s dynamic young leader. Peter implemented several innovative systems and procedures which improved customer and employee satisfaction. Peter’s achievements at Hobee’s and in the community at large led Congresswoman Anna Eshoo to nominate him for U.S. Small Businessperson of the Year in 1993. In 1994, the Tabers once again caught the expansion bug when a “can’t pass” proposal was made for a second San Jose location off Montague Expressway. The line-out-the-door opening proved that Hobee’s, even after two decades, was still reaching new markets. In 1996, after a two decade hiatus, the family made a triumphant return to Sunnyvale with yet another hit restaurant. In the fall of 1997, the Tabers opened a Hobee’s in Belmont / Redwood Shores. That restaurant marked the first family-owned site to be located in San Mateo County. The populous area, which boasts a healthy mix of business and residential occupants, proved to be an ideal setting for a Hobee’s. With the summer 1998 announcement that Town and Country Village in San Jose would be demolished, the Tabers launched a search for a nearby replacement location. In 1999, a deal was struck to place Hobee’s in the thriving Pruneyard Shopping Center in Campbell. The spacious restaurant drew immediate crowds upon opening in March of that year. Hobee’s San Jose closed the following spring and its passing was mourned by the many regulars who appreciated its funky charm. In 2005, a new leadership emerged at Hobee’s. Co-owner Edward Fike, a 1990 graduate of The Santa Clara University School of Law, took over as president from his partner Peter Taber, who assumed the role of chairman of the board. Ed forged an effective partnership with vice president and area manager Camille Chijate, who began her Hobee’s career in the late 1980’s. Together, they tightened operations and continued to strengthen the brand with innovative ideas. Though expansion seemed unlikely at the time, the owners were immediately intrigued when a former Baker’s Square location became available in Los Gatos in mid-2008. It was another “too good to pass up” opportunity. Just before Christmas that year, Hobee’s Los Gatos opened up to the biggest opening crowds in the chain’s 35 year history. Though Hobee’s was able to survive the turbulent economy of the next several years intact, a trio of closings within a twelve month period made headlines: Hobee’s Stanford was closed in January 2013 after the new ownership at Town and Country Village demanded costly renovations and increased rent. Los Gatos was also shuttered in August of that year after failing to live up to its promising start. Finally, popular Pruneyard served its last meal on January 5, 2014, as the owners faced the daunting prospect of a doubled rent. Fortunately, many employees who desired to remain with the company were placed at other Hobee’s locations following the closures. Notably, amidst the difficult farewells, the remaining restaurants posted sizable sales gains as customers selected new Hobee’s homes. It also didn’t hurt that Vice President Joe Biden made a splashy, well-publicized visit to Hobee’s Sunnyvale in June 2013. After riding the wave of Bay Area economic growth for the next several years, the stage was set for a major transition. In June 2017, the Taber family sold the chain to two trusted, longtime employees: the husband and wife team of Camille and Daniel Chijate. The Chijates certainly earned the opportunity with their hard work and dedication. Both Camille and Daniel had logged 28 years as Hobee’s employees. Customers and co-workers agreed that there was no better choice to carry on the Hobee’s legacy. 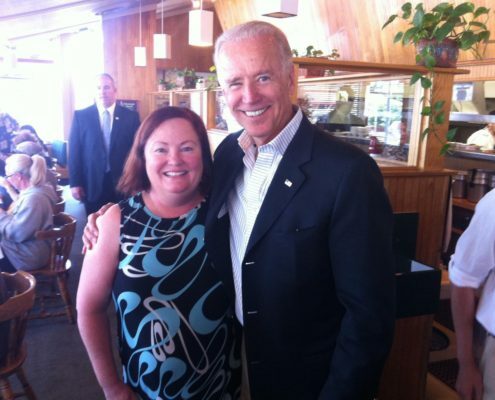 Camille Chijate, who took over as Hobee’s owner with her husband Daniel in 2017, had the honor of hosting Vice President Joe Biden at Hobee’s Sunnyvale four years earlier. Now, as the next era begins, the Taber name is no longer attached to the business. Nevertheless, Hobee’s remains in the family. We’re excited to continue the Hobee’s phenomenon for many years to come! Veteran restaurateur Paul Taber, along with wife Mary and children Peter and Connie, opens “Hobee’s Hamburger Haven”, a fast food concept with a healthy emphasis, in Mountain View. Hobee’s Mountain View in 1974: Groovy and take-out only! Peter Taber, who had attended the Berklee College of Music prior to joining the family business, creates Hobee’s signature recipe: cinnamon-streussel-topped blueberry coffeecake. A second Hobee’s, located at El Camino Real and Mary Avenue in Sunnyvale, begins a brief three year run which ends when the opportunity to open a higher profile location in Palo Alto arises. Hobee’s receives its first significant award from a local publication: New West Magazine calls it “the best breakfast in the Bay Area”. $ 1,000 for the first time. Hobee’s opens its doors in south Palo Alto on El Camino Real at the site of a former 1940’s casino. In conjunction with Foothill College, Peter Taber launches a series of cooking classes at Hobee’s Palo Alto featuring many of the healthful recipes served at Hobee’s. Customers fill several boxes with entry blanks in Hobee’s first annual Super Bowl Contest (then called “The Football Follies”), which offers a free Hobee’s meal a week for one year to the patron who comes closest to guessing the final score of the NFL’s championship game. To more efficiently serve an ever-expanding menu, Hobee’s converts to full table service. Hobee’s owners change the name of the corporation from “World’s Greatest Hamburger’s, Inc.” to “Taber Food Services, Inc.”. Capitalizing on its prime location across from Stanford University, Hobee’s Town and Country Village / Palo Alto opens to capacity crowds. A new marketing strategy is born when Hobee’s creates buzz by donating coffeecake to hundreds of appreciative racers at the annual “Bay to Breakfast” fun run in the Palo Alto Baylands. 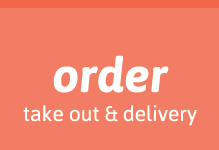 Hobee’s Franchising Corporation is formed to facilitate expansion to Bay Area markets including Santa Cruz, Fremont, and Emeryville, though only one of eight franchised locations – Cupertino – remains in operation today. Franchisees Gwil Evans, Michael Lashen and Gordon von Richter open Hobee’s Cupertino in the Oaks Shopping Center across from De Anza College and soon coast to the top of the chain’s sales charts. The company rolls out the popular “Hobee’s Goes Around the World” promotion, which entices customers to earn a free breakfast by taking a photograph at a famous locale outside of California wearing a Hobee’s t-shirt. For the Holiday Season, a new coffeecake flavor – cranberry – is introduced for the first time, giving rise to an annual “Ho Ho Ho Hobee’s” yuletide tradition. Patrons of Hobee’s Town and Country / Palo Alto are treated to an elaborate hoax courtesy of KSJO Radio as a Mikhail Gorbachev look-a-like mingles with customers at the restaurant while the real Gorby tours Stanford University several blocks away. Lengthy winning streaks for Readers’ Poll “Best Breakfast” awards begin in The San Jose Metro and The Palo Alto Weekly. Several Hobee’s employees hold a small fundraiser at a private home benefiting AIDS resource provider ARIS which evolves into the annual Club Hobee’s event (1993 – 1997) and raises over $ 75,000 for the agency. The Palo Alto Chamber of Commerce awards Hobee’s its prestigious Tall Tree Award for civic excellence. Hobee’s employees and VIPs gather at Hobee’s Mountain View for the inaugural Hobee’s Achievement Awards, an annual recognition event designed to honor the outstanding contributions of employees, customers and local businesses to the chain. At age 72, Hobee’s Montague Expressway server Warren Ramsey (who passed away in 2001) is honored by the California Restaurant Association as the state’s outstanding front house hospitality employee. A stubborn 3-alarm fire guts Hobee’s Town and Country Village / Palo Alto and several surrounding businesses, forcing an eight month closure. In town to drop off daughter Chelsea at Stanford University, President Bill Clinton and First Lady Hillary Rodham Clinton receive a welcome gift of Hobee’s coffeecake personally delivered by owners Peter Taber and Edward Fike. Founder Paul Taber dies of lung cancer at age 72. Soon after learning that Hobee’s Town and Country / San Jose will be bulldozed to make way for mega-development Santana Row, Hobee’s owners find a replacement site at nearby Pruneyard Shopping Center. The tech boom proves to be a mixed bag for Hobee’s: Sales spike as dotcommers spend freely, yet staffing – even high school labor – becomes a critical challenge. In a nod to its founders’ Hawaiian roots, Hobee’s introduces summer-long “Aloha Fridays” featuring tropical-themed promotions and specials, including pineapple-coconut coffeecake. Co-founder Mary Taber retires to Honolulu, Hawaii, the city where she lived for nearly three decades prior to starting Hobee’s. Supplementing several breakfast accolades won by the chain earlier in the year, Palo Alto Daily News readers choose Hobee’s burgers – including the Bandito, the Aztec and the Swiss Bliss – as the Peninsula’s best. 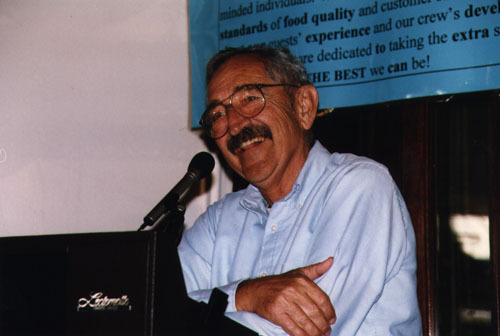 The San Francisco Chronicle gives perspective when it notes in an article about Hobee’s 30th anniversary that current president Peter Taber is the same age – 49 – his father was when he started Hobee’s. Peter Taber steps down as president and passes the torch to his partner and co-owner, Edward Fike, a graduate of the Santa Clara University School of Law. Fortune Magazine profiles Peter Thiel and Max Levchin, the founders of PayPal, and reveals that the duo first came up with the idea for their company over a meal at Hobee’s Stanford in 1998. Many of the major players of “Web 2.0” – including Facebook, YouTube and Yelp – trace their ancestries to PayPal. Nine years after its last restaurant launch, Hobee’s debuts in Los Gatos at Highway 9 and University Ave. The sales are the highest ever for any Hobee’s opening! Hobee’s reaches its milestone thirty-fifth year with nine Silicon Valley locations, over $ 12 million in annual chain revenues, 300+ employees and tens of thousands of loyal customers. Assemblymember Ira Ruskin chooses Hobee’s as the Outstanding Small Business from the entire 21st assembly district. The Campbell Chamber of Commerce also picks Hobee’s Pruneyard as its Business of the Year. Hobee’s Mountain View, the “Mother Store”, is recognized by the Mountain View Chamber of Commerce as the Outstanding Small Business of that year. Continuing an impressive streak that began in 2010, two more locations receive Business of the Year designations from their respective Chambers of Commerce: Hobee’s Cupertino (the sole Hobee’s franchise) and Hobee’s Los Gatos, which garnered the honor despite being open a little over three years. 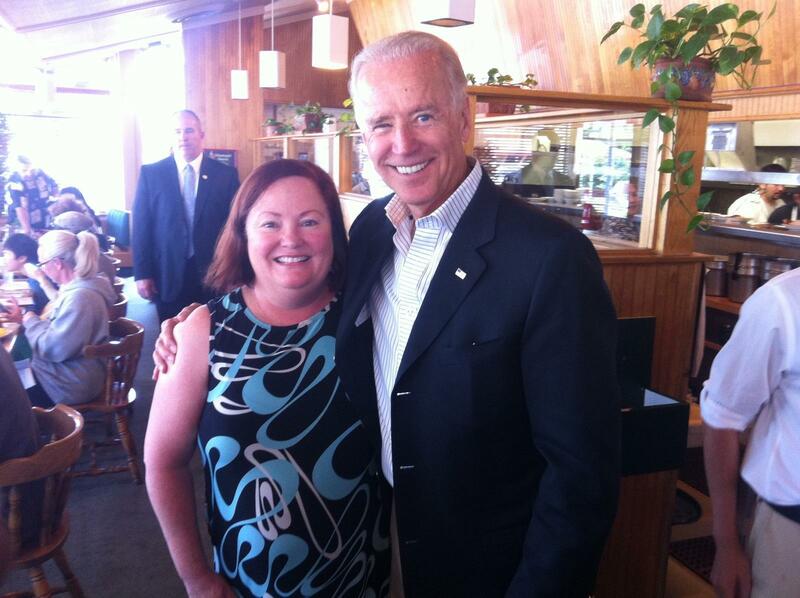 In June, a packed Saturday morning crowd at Hobee’s Sunnyvale was treated to a surprise visit from Vice President Joe Biden. Biden charmed the guests by taking photos and even visiting the cooks in the kitchen. While the first week of the year began on a down note – Pruneyard closed after 15 years due to a doubling of rent – the rest of 2014 was a reason for celebration. The 40th anniversary of Hobee’s was feted at chamber of commerce events in Mountain View, Sunnyvale and San Jose, while an Employee and Alumni Picnic was held in September. Guests also sent in hundreds of entries in a special contest: “40 Reasons We Love Hobee’s”.